classification which reflects mainly the uses, the occurrence, and the economic value of metals. First, the ferrous metals, i.e., the production of iron, steel, and ferroalloys are outlined. Then, nonferrous metals are subdivided into primary, secondary, light, precious, refractory, scattered, radioactive, rare earths, ferroalloy metals, the alkali, and the alkaline earth metals. Although the general tendency today in teaching extractive metallurgy is based on the fundamental aspects rather than on a systematic description of metal extraction processes, it has been found by experience that the two approaches are complementary. 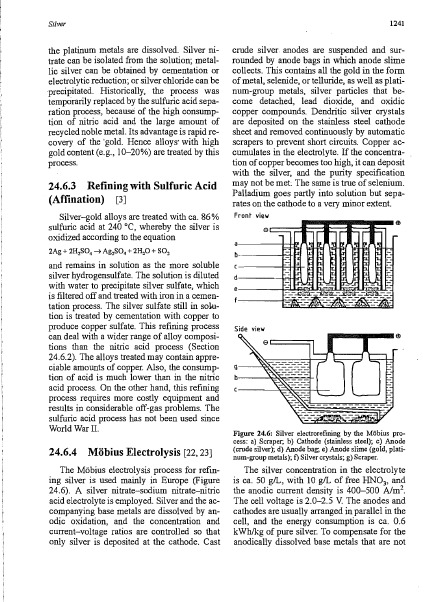 The student must have a basic knowledge of metal extraction processes: hydro-, pyro and electrometallurgy, and at the same time he must have at this disposal a description of how a particular metal is extracted industrially from different raw materials and know what are its important compounds. It is for this reason, that this Handbook has been conceived. 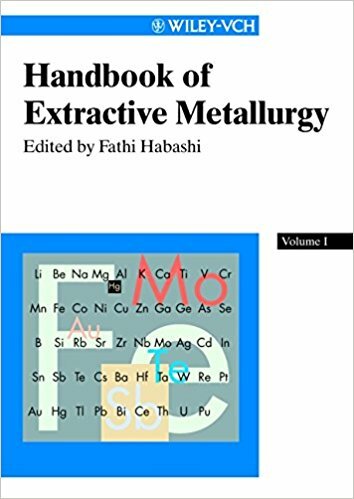 The Handbook is the first of its type for extractive metallurgy. 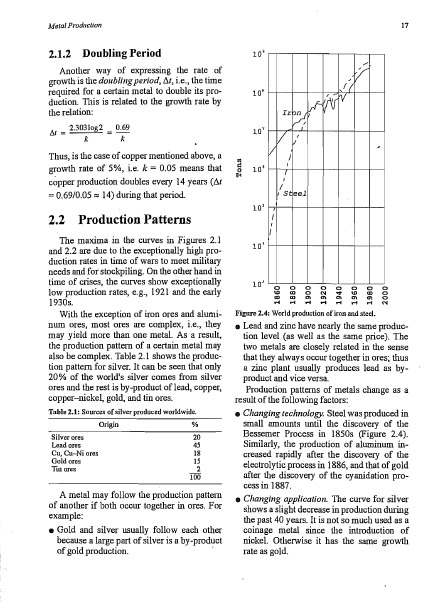 Chemical engineers have already had their Perry's Chemical Engineers' Handbook for over fifty years, and physical metallurgists have an impressive 18-volume ASM Metals Handbook. 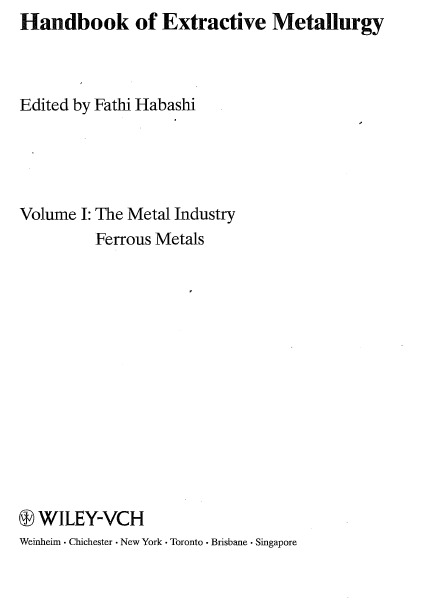 It is hoped that the present four volumes will f1l1 the gap for modern extractive metallurgy. 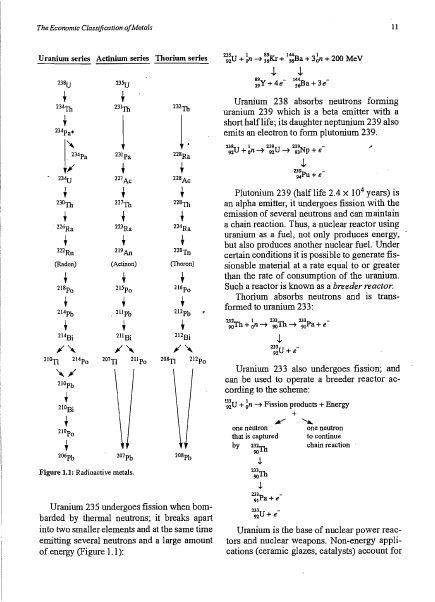 The Handbook is an updated collection of more than a hundred entries in Ullmann' sEncyclopedia of Industrial Chemistry written by over 200 specialists. Some articles were written specifically for the Handbook. Some problems are certainly faced when preparing such a vast amount of material. Economic Classification of Metals : While the Periodic Table classifies metals,metalloids, and nonmetals according to their chemical properties, it does not indicate their relative economic value. The fact that iron and its alloys, e.g., steel, are by far the most important metals from the point of view of production and use, has resulted in the classification of metals as ferrous (iron and its alloys) and nonferrous (all other metals and metalloids). This classification is well justified: the annual production of iron in one year exceeds the production of all other metals combined in ten years. Ferrous Metals : Iron produced in the blast furnace (pig iron) is converted into the following commercial products: Steel, wrought iron, cast irons, and pure iron. Steel is the most important product. Chemically pure iron is prepared on a small scale because of its limited use. Constructional Steel - This is used for the manufacture of machine parts, motor cars, building elements, slqr scrapers, ships, bridges, war instruments (cannons, tanks, etc. ), and containers. It can be carbon or alloy steel. The mechanical properties of alloy steel are considerably higher than those of carbon steel. chromium and nickel are the main alloying elements used in this category. Tool Steel - This is used for the manufacture of tools (lathe knives, chisels, cutters, etc.). It is either carbon (0.7-1.2% C), or chromium, manganese, silicon, or tungsten alloy steel. Manganese alloy steels are used to make machines such as rock crushers and power shovels, which must withstand extremely hard use. Special-Quality Steel - These include corrosion-resisting, stainless, acid-resisting, and heat-resisting steels. Stainless steel, which contains chromium and sometimes nickel and manganese, is a hard, strong alloy that resists heat and corrosion. Stainless steels are used for such things as jet engines, automobile parts, knives, forks, spoons, and kitchen equipment. Wrought Iron : Wrought iron was known since antiquity and was the major ferrous material produced until the nineteenth Century; it is produced now in limited amounts. Wrought iron is practically pure iron, low in carbon, manganese, sulfur, and phosphorus, but contains an appreciable amount of slag in mechanical admixture. Its desirable properties are due to the fibrous structure of this slag which gives it excellent resistance to shock and vibration, making it particularly suitable for the manufacture of such products as engine bolts, crane hooks, lifting chains and couplings. Wrought iron is readily welded, and the presence of slag makes it self-fluxing. It is readily machinable and cuttings are sharp and clean because the chips crumble and clear the dies instead of forming long spirals. Wrought iron is made from pig iron by melting in a furnace lined with ferrous oxide. Under these conditions, the entire carbon content of the pig iron is oxidized and removed, as well as most of the other impurities while silicon forms slag. 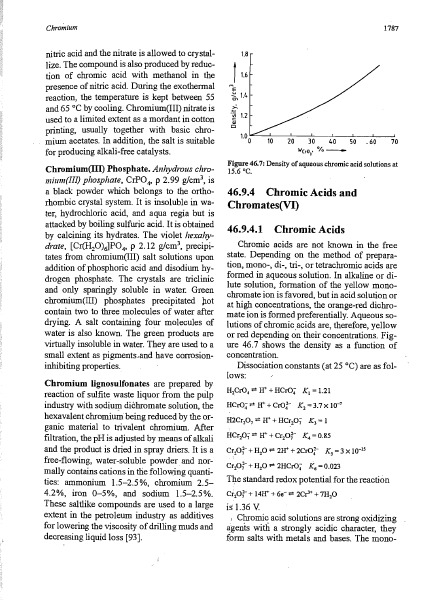 As a result, the melting point of the mass increases and a sticky lump is obtained saturated with slag. the lump, which weighs about 200 kg is removed from the furnace then put through a squeezer to remove as much slag as possible. Cast Iron : Cast iron is a series of iron-carbon alloys containing more than 1.5% C, together with silicon, manganese, phosphorus, and -sulfur which are impurities from the raw material and are not alloying elements. The form in which carbon-is present in the cast iron determines its properties. Grey Cast Iron : Produced by melting pig iron, scrap iron, and steel mixture to give the cast iron composition. The slow cooling and the high silicon content favors the decomposition of cementite into iron and free carbon in the form of flakes_ Gray cast iron is characterized by its power to damp vibrations and by the wear resistance imparted by the lubricating effect of graphite. Both properties make it a useful material for the construction of machinery by casting. It is readily machinable (due to graphite flakes) and is an economic material since it has a low melting point of about 1200 DC. It has, however, poor toughness and limited tensile strength. White Cast Iron : Produced by melting pig iron and steel scrap. After solidification no carbon is precipitated but remains in combination as iron carbide. It is hard, brittle, and unmachinable. It is used for making grinding balls, dies, car wheels, but mostly used for making malleable cast iron. Malleable Cast Iron : Prepared from white cast iron by annealing for several days, whereby iron carbide is decomposed into iron and graphite in form of nodules. It is more ductile and more resistant to shock than grey cast iron. It is used in large quantities for such materials as pipes and pipe fittings and the automative industry requiring higher mechanical properties. Pure Iron : High-purity iron possesses temporary magnetism, i.e., when the magnetic field is removed, the magnetism disappears. Carboniron alloys on the other hand, show permanent magnetism. For this as well as for other reasons, e.g., studying the physical properties of the metal, the preparation of high-purity iron is of scientific interest. Preparation of pure iron is a tedious process that requires special techniques and numerous operations properties, use, and occurrence .This classification is arbitrary since one metal may be placed in two groups, e.g., titanium is both a light and a refractory metal, rhenium is both scattered and refractory; similarly hafnium. The term "rare metals" is sometimes applied to the refractory, scattered, radioactive, and the lanthanides collectively. This terminology is misleading because such metals are not rare; it may be the difficulty in their extraction and uncommon utilization that give the impression that they are rare. metal. Its annual production exceeds by far that of all other metals combined. It comprises approximately 93% of the tonnage of all the metals used. Occurence : Iron is a relatively abundant element in the universe. It is found in the sun and many stars in considerable quantity. Iron is found native as a principal component of a class of meteorites known as siderites. The core oftI(e earth is thought to be largely composed of iron. The metal is the fourth most abundant element in the earth's crust: about 5% is iron. Iron is a vital constituent of plant and animal life, and appears in hemoglobin. Ferronickel - Ferronickel is an iron-nickel alloy that occurs in nature as the mineral awaruaite, FeNi3 (named after Awarua Bay in New Zealand, where it was first discovered), and josephinite, FeNi2 (named after Josephine County, Oregon where it was first discovered). Both minerals contain cobalt, usually in the ratio Ni: Co = 10: 1. Ferronickel also occurs as microscopic lamellre in association with asbestos, as microscopic crystals in association with serpentine, or as microscopic particles associated with the minerals pentlandite, (Fe, Ni)S, and hazelwoodite, NiS, in serpentine rocks (Figure 5.1). Thus it occurs in most asbestos formations and can be recovered from the asbestos tailings by magnetic methods. grey to black opaque color, with metallic luster, strongly magnetic. • Limonite is a geologic term signifying certain deposits of hydrated iron oxides which vary in color from brown to yellow. It is formed by the weathering and alteration of other iron-bearing compounds. When present in a loose, porous and earthy deposits in swamps, it is known as bog iron ore. When mixed with clay it forms what is known as yellow ocher. Most limonite ores require washing to remove clay, and drying to remove moisture, before shipping or reduction. • Taconite is another geological term signifying an iron ore deposit consisting of fine grains of hematite and magnetite embedded in a matrix of silica. It is difficult to drill and blast but easy to grind. Large deposits of this type occur in the Lake Superior region containing 25-35% Fe. Enrichment can be effected by magnetic methods to separate magnetite, and flotation to separate hematite to achieve a concentrate containing 63% Fe. • Oolitic ironstone is iron carbomite which has replaced the CaC03 of an oolitic limestone retaining the texture of the original rock. The rock consists of small round grains resembling the roe of fish.